CONGRATULATIONS to Wil Parker, Tyler Charlton and Brodie Horsley – all in the Eastern Ranges Under 16 Team! 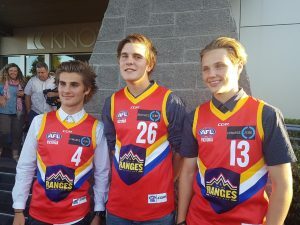 Wil Parker, Tyler Charlton and Brodie Horsley from the East Ringwood Under 17s made the 2018 Eastern Ranges Under 16 team. They have just played in the Under 16 TAC Cup carnival with the boys all playing great footy. Further to this news is out of the carnival, the U16 Vic Metro squad was selected with Wil Parker making the squad. Trials and training start on April 18 at IKON Park. No Replies to "CONGRATULATIONS to Wil Parker, Tyler Charlton and Brodie Horsley - all in the Eastern Ranges Under 16 Team!"